A bus or coach ride is a great way to explore some of London’s most famous landmarks. Here are 10 attractions you can visit in London using our coach services. London is a tourist’s delight. From history to nature, culture, and entertainment, the city offers something for everybody. Tourists also have an easier time in London because of its efficient public transport system. But if there’s one mode of transport that makes sightseeing in London the most effortless, it’s a coach rental. A coach hire is a great way to cover several of the top attractions in London. No tour of London can be complete without taking in the gorgeous views offered by the London Eye. Extending more than 130m into the sky, the London Eye features 32 glass-walled capsules that offer stunning vistas of the bustling city below. The London Eye keeps spinning throughout the day at a pace that is slow enough for you to easily enter and leave a glass capsule. And just across the London Eye is one of the UK’s most loved buildings. Yes, we are talking about the Big Ben. While not actually referring to the building itself (Big Ben is the name of the massive bell it houses), the tag caught on and the structure itself became part of countless books and movies. Lovers of arts and culture are spoilt for choice in London. A coach travel itinerary can take you to some of the country’s most famous cultural centres like the National Gallery, the British Museum and of course, Madame Tussauds. While the lattermost needs no introduction, the former two are famous in their own right. For instance, the National Gallery is home to beautiful paintings that hark back to the Renaissance period. The British Museum, similarly, houses the largest collection of mummies after Egypt and offers over seven million exhibits from around the world. You can also opt for a luxury coach hire that takes you across buildings and structures of historic and public importance in the UK. Chief among them is the Palace of Westminster, which is the seat of the UK government. It’s also known as the Houses of Parliament and consists of the House of Commons and the House of Lords. If the parliament is in session, you can also watch live the two houses conducting their business. But no tour of London can be complete without a glimpse of its monarchy and history. Buckingham Palace is where you want to be for the former as it’s the official residence of Queen Elizabeth II. Although the palace is owned by the UK government, millions throng it each year to watch the famed ‘Changing of the guard’, whereby the Queen’s guard changes every morning in an elaborate ceremony. Your coach travel schedule can end with a visit to the Tower of London and Westminster Abbey. The former is famous for being home to the British crown jewels while the latter is a beautiful gothic-style church where the British monarchy changes hands with a lot of fanfare. 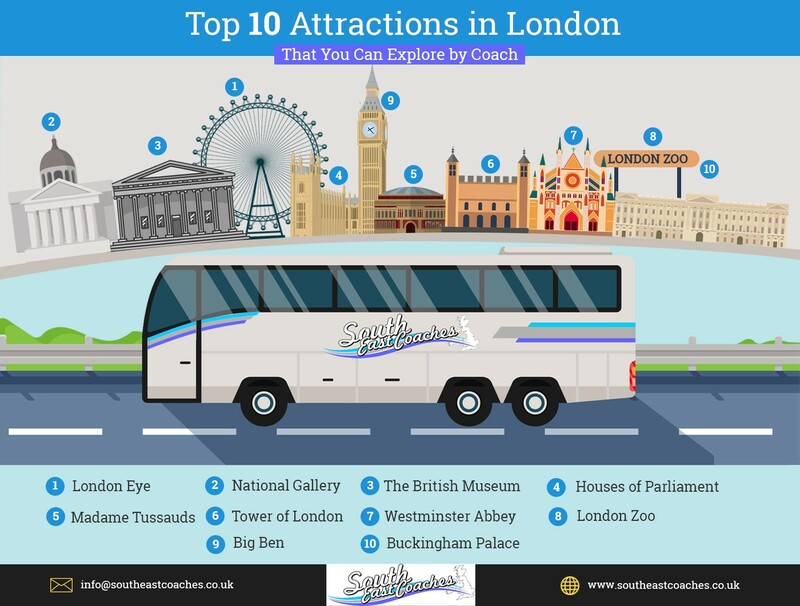 While these are some of London’s most famous destinations, you can go for a coach hire that offers an itinerary better aligned to your preferences. With coach travel, you can explore what London has to offer in a secure and comfortable environment. If you want to know more about London coach tours from Essex, get in touch with Southeast Coaches today. In addition to tours of London, we also offer coach travel to popular destinations in and around the city. A 440 ft high observation wheel featuring 32 glass capsules, the London Eye offers fantastic views of Central London and the River Thames and is the most popular paid attraction in the UK with over 3.5 million visitors annually. A true paradise for art lovers, the National Gallery is home to a large and exquisite collection of paintings belonging to the Western European tradition. The collection dates between the 13th and 19th centuries. Established in 1753, the museum has some of the rarest exhibits from human history and culture. Among its seven million objects are the world’s second largest collection of mummies and the Rosetta Stone. The seat of the UK government, the Houses of Parliament is an fine specimen of Victorian neo-Gothic architecture. It’s also known as the Palace of Westminster and allows visitors to watch live proceedings. First opened over 200 years ago, Madame Tussauds offers a collection of life-like wax statues and presents a fabulous opportunity to get up-close and personal with famous personalities from around the world. Home to the world-famous British Crown Jewels, the Tower of London was built in the 11th century and served as a prison till the mid-20th century. Its famous inmates include King Henry VI and Sir Thomas More. One of the UK’s most important religious buildings, the Westminster Abbey is a massive church built in the Gothic style and the designated coronation and burial place for English and, later, British monarchs. The world’s oldest scientific zoo, the conservation-focused London Zoo houses some of the most exotic animals from around the world. Its star attractions include the Butterfly Enclosure and the Gir Lion Safari Lodge. The Big Ben Clock Tower is over 150 years old and named after the first man to order its bell, Benjamin Hall. One of the most recognized buildings in the world, the clock tower has appeared in countless books and movies. The main residence of Queen Elizabeth II, the Buckingham Palace is world-renowned for the ‘Changing of the Guard’ ceremony. Tourists have access to the palace’s state rooms between August and September.